Five miles off Pt. Pelee. Three lives lost. Enroute to wreck of barge H.P. BALDWIN Colchester, ONT. when boat sprang a leak & sank. 1883 Rebuilt; dimensions recorded 62.8' x 14.9' x 8'; 44.67/22.23 tons. 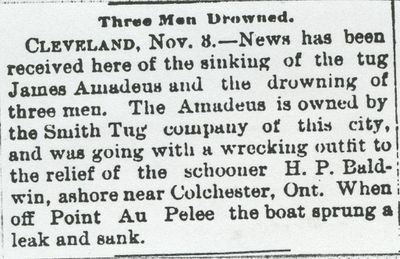 1892, Nov 3 Sank Lake Erie.